A new LNG plant and ship loading facilities was developed by Santos Ltd. at China Bay on Curtis Island at Gladstone. Major elements of the LNG plant include three (3) gas treatment ‘trains’ up to 25m high, storage tanks approximately 40m high and flare stacks up to 100m high. Off-shore loading facilities include an LNG loading dock and jetty connected to the LNG plant. A bridge was proposed across ‘The Narrows’ connecting Curtis Island and the mainland. 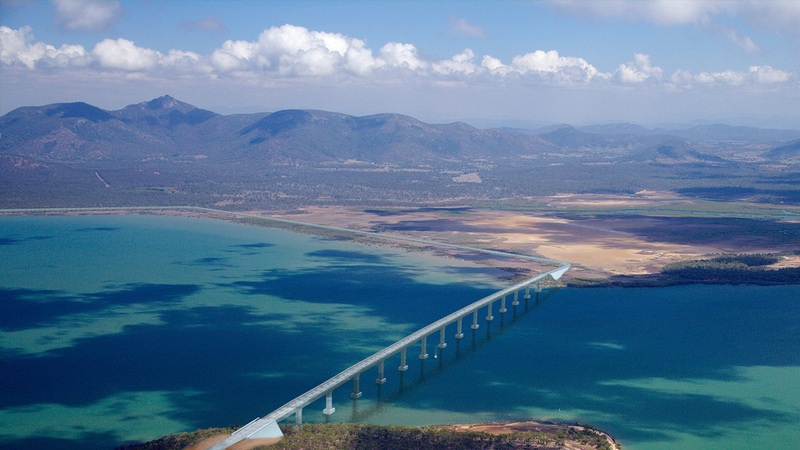 The combination of large scale and visual prominence on the northern side of Gladstone Harbour meant that potential visual impact was a significant issue to be addressed by the Environmental Impact Assessment (EIS). To address the issue URS engaged Corkery Consulting as specialist consultants to carry out the visual assessment component of the EIS. The landscape context of the proposed LNG plant was assessed through an analysis of the landscape character of Curtis Island and part of Gladstone. The analysis identified a series of Landscape Character Zones (LCZ’s) and described them in terms of landform, vegetation and land use. The landscape significance of the site was then considered in terms of the local, regional, state and international context. from a helicopter hovering over the site. At the same time photographs were taken from key view situations with the helicopter visible to provide a reference point in preparing the visual simulations of future views. Channel 7 RPD Media was engaged by the client to prepare a series of simulations of views of the LNG plant from key view points. The simulations show the plant at daytime as well as night and the likely view if gas flaring was required at night. associated with the LNG plant, bridge and access road were assessed by taking account of the level of visibility together with the visual sensitivity of viewers. A range of mitigation measures were recommended to minimise the potential level of visual impacts of the LNG plant, bridge and access road. They included careful selection of materials and colours as well as landscape works and lighting design principles.